IMPORTANT PRODUCT INFORMATION READ THIS INFORMATION FIRST Product: IC693CPU364 CPU Module with Ethernet Interface IC693CPU364-EK with CPU Firmware Version 10.71 This document contains information that is not available in any other publication; therefore we recommend you save it for future reference. This release consists of a hardware update on the Ethernet daughterboard. Hardware Identification The following table shows the revision level of the circuit boards used in this version of the IC693CPU364 CPU Model (Version) Circuit Board ID Circuit Board Version CX3A1 (CPU) 44A739579-113F or later IC693CPU364-EK EE3A1 (Ethernet) 44A739599-105F or later Upgrade Strategy CPU firmware version 10.71 is identical to version 10.60 except for the release number. TCP/IP firmware version 1.30 is compatible with all versions of the Ethernet hardware, but there are no functional changes for previous versions. Accordingly, no field upgrade is necessary. New Features and Enhancements Full Duplex Capability This hardware revision provides the option of selecting full duplex Ethernet communications on the 10BaseT port. Half duplex communications is the default communications mode for the module. To select full duplex communications, use the chparm command in the station manager Maintenance State as follows: <<< Maintenance State >>> Invoked due to MAINT command * chparm lfduplex 1 Old value = 0 (0000H) New value = 1 (0001H) Data backup in progress, do not restart or power off until next prompt After a restart, Ethernet communications will use full duplex mode. Note that full duplex operation is not indicated by a LAN Interface Status Word bit as it is in some other GE Fanuc Ethernet products. 2 Important Product Information GFK-1490P Warning Contrary to the recommendation of IEEE Std. 802.3, this Ethernet interface module does NOT support auto-negotiation of half/full duplex. Attempting full duplex operation of this interface with a repeater or half duplex network (including autonegotiating hubs and switches) can cause severe network performance degradation, increased collisions, late collisions, CRC errors, and undetected data corruption. To use full duplex mode, the 10BaseT port must be connected directly to a port on a managed Ethernet switch, and the switch port must be manually configured for full duplex operation at 10 megabits/second. The current duplex mode may be determined by using the station manager node command. > node IC693 Embedded PLC Factory LAN Interface Copyright (c) 1998. All rights reserved. Version 1.30 (44A1) TCP/IP Version 2.00 (35A1) Software Loader IP address = 10.0.0.1 MAC address = <<000991404000>> 10BaseT network connector in use, half duplex operation Functional Compatibility Subject Description Series 90-30 Hand-Held Programmer Compatibility The CPU 364 does not support Ethernet or station manager port configuration using the Hand-Held Programmer (HHP). Programmer Version Requirements Machine Edition Logic Developer PLC version 2.11 or later, VersaPro version 2.02 or later, Control software version 2.20 or later, or Logicmaster 90-30 version 9.02 or later should be used to configure and program the CPU 364. The following restrictions apply: Machine Edition Logic Developer PLC version 2.11 or later, or VersaPro version 2.02 or later is required to support motion (DSM) files larger than 32K bytes. Machine Edition Logic Developer PLC version 2.11 or later, or VersaPro version 1.11 or later is required to support C programming and SFC subroutines. Control version 2.20 or later, or any version of Machine Edition Logic Developer PLC or VersaPro is required to support Ethernet Global Data and configurable Name Resolution. Control version 2.00 or later may be used to configure and program a CPU 364 subject to the restrictions above. Logicmaster 90-30 version 9.02 or later may be used to configure and program a CPU 364, but it does not support Ethernet Global Data, configurable Name Resolution, or the IC693DSM314 module. Note: The Logicmaster 90-30 No Model Number Checking feature does not support storing a CPU 311, 313, 321, 323 or 331 configuration to a CPU 364. PLC C Toolkit Version Requirements Version 4.00 or later of the PLC C Toolkit must be used for C programming. Important Product Information 3 GFK-1490P Subject Description IC693CMM321 Ethernet Interface Version Requirements All Ethernet Interface (IC693CMM321) modules used for programmer or HMI/SCADA communications with this CPU must be one of the following revision groups: IC693CMM321-CC or later IC693CMM321-AA or -BA upgraded to firmware version 1.11 or later IC693BEM340 FIP Bus Controller Version Requirements IC693BEM340 firmware version 3.00 or later is required for this release of CPU 364 firmware. CPU364 Restrictions and Open Issues Subject Description Timing issue with IC693ALG220/221-F or earlier modules may result in incorrect %AI values read by CPU. The %AI values reported by an IC693ALG220/221-F or earlier module revision may be incorrect and exhibit erratic behavior. Certain current or voltage levels within the input range applied to the module can cause the %AI values to be reported incorrectly. The problem stems from the use of particular opto-couplers that may exhibit timing issues with CPU 35x/36x modules. This issue does not occur with IC693ALG220/221-G and later module revisions. The CPU may generate a fatal fault if logic containing a DOIO function block call to a smart module is repeatedly transitioned between RUN and STOP modes. Storing program logic that contains a call to a DOIO function block may cause the CPU to run out of system memory. This can occur when the PLC transitions between RUN and STOP modes several times. Storing the hardware configuration will cause the system memory to be freed, and the PLC will resume normal operation. The CPU may generate a fatal fault during store of folders with large configurations The CPU may generate a fatal fault during a store of a folder with a very large configuration. This may be made worse by storing logic and configuration at the same time, or by read requests for reference table data from a programmer or HMI during the store. See Storing Large Configurations in section 6 of this document for recommendations. PID Integral Contribution The PID Integral Contribution is not calculated correctly with an integral rate of 2 or higher. Reading corrupted data from flash memory may cause a Watch Dog Timeout If corrupted data is read from flash memory, the Watch Dog Timer on the PLC may be triggered. This can be corrected by completing a valid flash store. The CPU may generate a fatal fault when configuring a module with the HHP following a store to the PLC that exhausts user memory. The 9030 PLC CPU may generate a fatal fault when the user attempts to configure a module with the HHP after a store to the PLC that exhausts user memory. Firmware update may fail following power-up with Clear M/T and a write to flash A firmware upgrade may fail after the user presses the Clear and M/T keys on the HHP during power-up and then performs a write to flash. Cycling power on the PLC will enable the upgrade to proceed. 4 Important Product Information GFK-1490P Ethernet Restrictions and Open Issues Subject Description Restart May Cause Inappropriate Log Event and PLC Fault. When the CPU 364 Ethernet Interface is restarted using either the restart button or the station manager restart command, an exception log event 11, entry 2 = 5, may occasionally be observed after the restart. The corresponding PLC fault has this text: Local request to send was rejected; discarded request. The event occurs when the IP layer attempts to send a packet on the network after the Link layer has gone offline. Both the log event and PLC fault should be disregarded. Multiple Log Events The Ethernet Interface sometimes generates multiple exception log events and PLC Fault Table entries when a single error condition occurs. Under repetitive error conditions, the exception log and/or PLC Fault Table can be completely filled with repetitive error messages. DDP2 Name Not Used In systems using more than 75 Ethernet Global Data exchanges, the Ethernet Interface may not initialize with the user-configured DDP name (if any), but rather use the default DDP name. Attempts by remote stations to communicate with the Interface using the userconfigured name will fail. Possible workarounds include: 1. Reconfigure the application to use less than 75 exchanges, or 2. Have remote stations refer to the Interface by its default DDP name Same IP Address Use of the same IP Address by the CPU364 and by another device on the same network results in the PLC Fault Table message Bad remote application request; discarded request. This condition should be identified more precisely. Trace LZ While a local Station Manager TRACE LZ troubleshooting command is in effect at an Ethernet Interface, do not issue Station Manager REM TEST commands to it from a remote Interface. Doing so can cause errant behavior, including module lockup and loss-of-module in the PLC fault table. EGD status code The status code of an EGD exchange is not updated to 16 while performing Name Resolution, as described in the manual. The first status code update occurs when the Name Resolution is complete, either 0 if successful or 4 if unsuccessful. Write Channel Retasking Error When retasking a Write Channel, the Ethernet Interface may very intermittently generate exception log event 1c, entry 2 = 5; the channel stops with status code 9590 (= internal error). The application program may issue another Write Channel CommReq to start this channel. Intermittent SNTP Loss of Synchronization Under moderately heavy EGD traffic load, the Ethernet Interface may occasionally lose synchronization with its SNTP time server and generate exception log event 29, entry 2=bH. Important Product Information 5 GFK-1490P Operational Notes CPU Operational Notes Subject Description User FLASH Contents The user program, configuration, CPU ID (used for SNP communication), and reference memory tables stored in RAM will automatically be cleared when the CPU firmware in flash memory is changed. The user will need to restore these when upgrading from a previous firmware version. The user program, configuration, and reference memory (%R, %AI, %AQ, %I, %Q, %T and %M) tables can be restored from a PLC programmer folder or from flash. The SNP ID must be set separately, using the PLC programmer or the HHP. The faults, overrides and transition tables cannot be stored to flash. The overrides may be restored from the programmer or folder, but the faults and transitions are lost. Firmware Upgrade Procedure Note: The Model 35x and 36x CPU operating firmware is stored in flash memory. The firmware upgrade is provided on a CD, a diskette, or from the GE Fanuc PLC Technical Support web site and must be downloaded serially from a Personal Computer. A PC running Windows 95 or later with at least one RS-232 serial port is required. In addition, two serial cables are required. The following serial cables are available from GE Fanuc: IC690ACC901 Mini Converter Kit with Cable (RS-232/RS-485) IC693CBL316A Serial Cable Writing FLASH Memory When writing very large programs to flash, you may need to increase the request timeout value in the programming software to avoid receiving a request timeout message. An upper bound of 25 seconds is typically satisfactory. Storing Large Configurations A Series 90-30 PLC using a CPU 364 supports a maximum of 32 DSM314 modules. 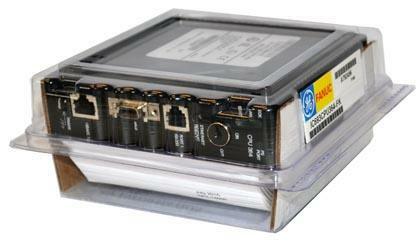 This number is reduced when other intelligent modules are used in the PLC, such as APM and GBC modules. It may also be reduced when: The number of racks in the PLC increases; The total size of logic, motion and AUP files increases; The application uses C logic blocks or a C logic program; and Connected programmers or HMI devices are used to read reference memory or fault tables. In some cases it may be possible to increase the number of DSM341 modules that the CPU 364 will accept in the hardware configuration by storing logic first and then storing the configuration separately. No Model Number Checking with LM90 Logicmaster 90-30 programmer The Logicmaster 90-30 No Model Number Checking feature does not support storing a CPU 311, 313, 321, 323 or 331 configuration to a Release 9.00 or later Series 90-30 CPU. Do not attempt to store CPU 311, 313, 321, 323 or 331 configurations to a CPU364. Minimum Sweep Time In Release 10.50 and later, the minimum CPU 364 sweep time (while in RUN mode with an empty user program) was reduced about 1 millisecond compared to older releases when Ethernet Global Data is not configured. Simultaneous Load and Store When operating with multiple programmers attached, initiating a store operation from one programmer during a load operation from another programmer will cause the load to fail. Transition Tables are not cleared when the reference tables are cleared The transition tables are not cleared when the reference tables are cleared through programming software. 6 Important Product Information GFK-1490P Ethernet Operational Notes Subject Description Time-out During RUN-mode Store During a Run Mode Program Store of a large program block (greater than 14K bytes), the Ethernet Interface may time out, causing communications to fail. Changing the Communication Window to Run-to-Completion mode, or storing the program in STOP mode, will allow the store to complete successfully. Documentation Instructions for using the IC693CPU364 module can be found in the latest version of the following manuals: Series 90-30 Installation and Hardware Manual, GFK-0356 Series 90-30/20/Micro CPU Instruction Set Reference Manual, GFK-0467 TCP/IP Ethernet Communications for the Series 90 PLC User s Manual, GFK-1541 TCP/IP Ethernet Communications for the Series 90 Station Manager Manual, GFK-1186 Important Product Information 7 GFK-1490P a47501 CPU 364 SNP STATION MGR RS - 232 AAUI EOK LAN FRAME STAT ETHERNET RESTART 10BASE T ON OFF PS PORT CPU 364 IC693CPU364 Data CPU Type Single slot CPU module with embedded Ethernet Interface Total Baseplates per System 8 (CPU baseplate + 7 expansion and/or remote) Load Required from Power Supply 1.1 Amps from +5 VDC supply Processor Speed 25 MegaHertz Processor Type 80386EX Ethernet fuse, replaceable 2.69x2.69x6.1 mm, 125V, 1A, slow acting Operating temperature 0 to 60 degrees C (32 to 140 degrees F) ambient Typical Scan Rate .22 milliseconds per 1K of logic (Boolean contacts) User Memory (total) 240K (245,760) Bytes. Note: Actual size of available user program memory depends on the amounts configured for the %R, %AI, and %AQ configurable word memory types (described below). Discrete Input Points - %I 2,048 Discrete Output Points - %Q 2,048 Discrete Global Memory - %G 1,280 bits Internal Coils - %M 4,096 bits Output (Temporary) Coils - %T 256 bits System Status References - %S 128 bits (%S, %SA, %SB, %SC - 32 bits each) Register Memory - %R Configurable in 128 word increments, from 128 to 16,384 words with DOS programmer, and from 128 to 32,640 words with Windows programmer Ver. 2.2 or VersaPro 1.0 or later. Analog Inputs - %AI Configurable in 128 word increments, from 128 to 8,192 words with DOS programmer, and from 128 to 32,640 words with Windows programmer Ver 2.2 when available or VersaPro 1.0 or later. Analog Outputs - %AQ Configurable in 128 word increments, from 128 to 8,192 words with DOS programmer, and from 128 to 32,640 words with Windows programmer Ver. 2.2 when available or VersaPro 1.0 or later. System Registers (for reference table viewing only; cannot be referenced in user logic program) 28 words (%SR) Timers/Counters >2,000 (depends on available user memory) Shift Registers Yes Built-in Serial Ports 1 (uses connector on PLC Power Supply). Supports SNP/SNPX. Requires option modules for RTU and CCM. Communications Ethernet (internal) AAUI or 10Base T. AAUI requires external transceiver. 10Base T is direct. Ethernet (additional) Supports Ethernet option modules. LAN Requires option modules for Genius, Profibus, FIP. Override Yes Battery Backed Clock Yes Interrupt Support Supports the periodic subroutine feature. Type of Memory Storage RAM and Flash PCM/CCM Compatibility Yes Floating Point Math Support Yes, firmware-based Notes: On earlier modules, the LED labeled PS PORT may read SNP, and/or the port labeled STATION MGR RS-232 may read PORT 1 RS-232 ; these are labeling changes only - the functionality was not changed.